On a sunny afternoon in late June 1914, Cambridge professor Joseph Reavley learns that his parents have died in an automobile crash. Josephs brother, an officer in the Intelligence Service, reveals that their father had been en route to London with a mysterious secret document allegedly possessing the power to disgrace England and destroy the civilized world. Now, that explosive paper has vanished, and Joseph is left to wonder: How had it fallen into the hands of his father, a quiet countryman? But Joseph is soon burdened with a second tragedy: the shocking murder of his most gifted student, who was loved and admired by everyone. Or so it appeared. And as Englands seamless peace begins to crack, the distance between the murder of an Austrian archduke and the death of a brilliant student grows shorter every day. On a sunny afternoon in late June 1914, Cambridge professor Joseph Reavley learns that his parents have died in an automobile crash. Joseph's brother, an officer in the Intelligence Service, reveals that their father had been en route to London with a mysterious secret document- allegedly possessing the power to disgrace England and destroy the civilized world. Now, that explosive paper has vanished, and Joseph is left to wonder: How had it fallen into the hands of his father, a quiet countryman? But Joseph is soon burdened with a second tragedy: the shocking murder of his most gifted student, who was loved and admired by everyone. Or so it appeared. And as England's seamless peace begins to crack, the distance between the murder of an Austrian archduke and the death of a brilliant student grows shorter every day. which she masters and makes her own." "Perry's melancholy evocation of the 'eternal afternoon' that would soon turn to night all over England is lovely." -"The New York Times Book Review"
"[A] beautifully constructed book, the start of a new series of five novels about England's favorite obsession, World War I." 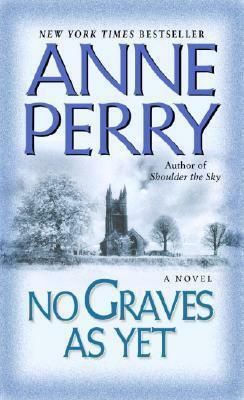 Anne Perry is the bestselling author No Graves As Yet, as well as two acclaimed series set in Victorian England. Her William Monk novels include Death of a Stranger, Funeral in Blue, Slaves of Obsession, and The Twisted Root. She also writes the popular novels featuring Charlotte and Thomas Pitt, including Seven Dials, Southampton Row, The Whitechapel Conspiracy, and Half Moon Street. Her short story “Heroes” won an Edgar Award. Anne Perry lives in Scotland. Visit her Web site at www.anneperry.net.